What If Tomorrow Was Your Day??? Well I have a confession to make. I said that they other day. I’ve been fighting for a physical goal that I know very well I can attain and yet it’s been 2 years and I feel like I’ve taken steps backward instead of forward. I’ve found myself discouraged, ready to give up, and feeling like a failure. I was talking with my brother, Randall, who has taken on a new career venture that is going to push him mentally. During the conversation I mentioned that the most successful people aren’t the most knowledgeable, the most talented, or even the most well liked but rather the ones who refused to give up. Their perseverance is what eventually leads them to success. Randall brought up the picture of the diamond hunter who gave up digging only inches away from finding the diamond mine. I almost dropped my phone as I realized that is exactly where I am in my physical journey. I’ve been fighting for a goal that has eluded me for 2 years and have been allowing thoughts of defeat and failure to run my day. I was giving up on something that is very important to me because I wasn’t seeing the “diamonds” quick enough. What if tomorrow was going to be the day something clicked and my body responded to the training, my mind worked with me to keep my thoughts positive and make healthy eating choices…but instead I gave up on my goal today? Being in the fitness industry for 15 years I’ve heard, “it doesn’t matter what I do I can’t lose weight” more times than I can count. I’ve seen people who struggle with this on a daily basis and I’m still fighting along side people who feel this way. It is one of the most heartbreaking things to watch because I know they are giving it their all and pushing themselves physically and mentally but not seeing the results they feel they deserve from their efforts. While there are hundreds of reasons including metabolic conditions, family health history, medications/environmental issues, etc I do not believe anyone is destined to living in a body they are not comfortable with. Can I “fix” everyone? Absolutely not! What I can do is provide the education and motivation to empower each person to achieve the results they are looking for. It might take more time than they wanted. But they will have the hope and encouragement in knowing that their time is coming because one thing is for sure. 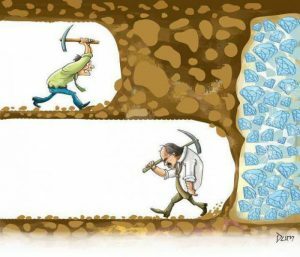 If you give up, you never know what you’ll be missing! 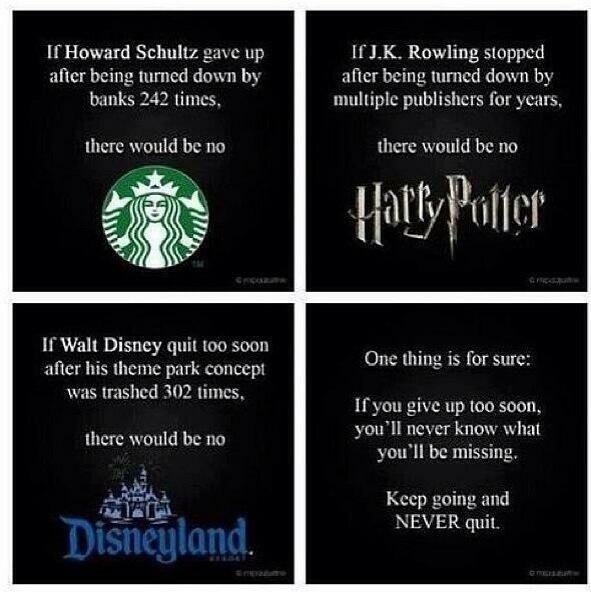 Keep going and never quit. Whether it takes 3 months or 3 years or 3 decades, do not allow time to tell you that your goal is not worth fighting for. 3 Crucial Steps to Avoid Quitting! Write out your goals. Check out our goals setting sheet to make sure that you are doing everything you can to get to where you want to be! Email [email protected] to get our Goal Setting we use for our clients! Review your goals daily. With my goals, healthy eating is a huge must. I’ve found that the days I fall off the bandwagon are typically the days I haven’t reviewed my goals! It’s so easy to forget this step that I set alarms on my phone to remind me. Another thing you can do is create “triggers” that will remind you. For example, every time you brush your teeth have your goals posted by your toothbrush. Or post your goals in the bathroom so when you go to the toilet you see them. Simple reminders throughout the day are going to help you stay motivated and making good choices! Find an accountability partner. Check out https://impulsetraining.com/it-take-two/ to see just how crucial this step is! If you go to our website and type in a word in the search bar you will find dozens of articles addressing topics such as goal setting, motivation, accountability, etc. 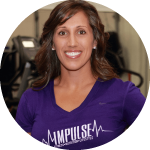 Are clients have achieved massive results by following these simple principles. Remember, it isn’t about the newest diet, the newest workout fad but rather hard work, perseverance, and most importantly, hope that tomorrow is YOUR day!!! !